Homestate Properties is a private Manhattan brokerage specializing in residential and commercial transactions. As the in house creative team at HSP, we wanted to create an aesthetically pleasing yet commanding logo to reflect the company's strong presence in the real estate industry. Keeping the font type thick and heavy, we highlighted the name with three letter initials, using the full company name as an underscore, then dividing it into 3 main divisions on the bottom. 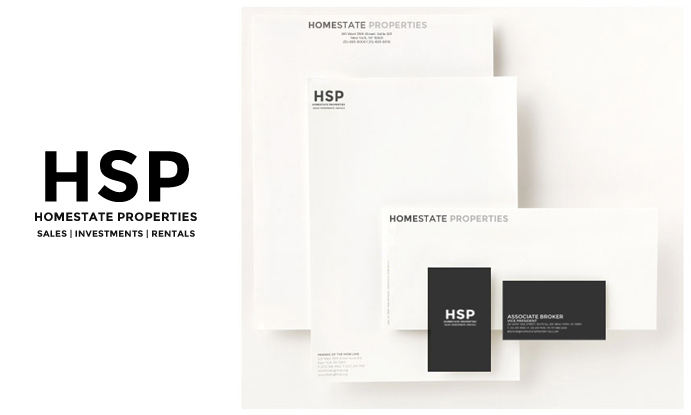 Envelopes, letterhead and business cards were created with both the HSP & Homestate Properties versions. A Facebook page was created and filled with visual and informative content, giving users insight into the fast paced real estate world. Listing photos, infographs, quotes and industry shared links are uploaded daily. A Pinterest page was created to give visual direction to HSP clients (and brokers) looking for reference points of inspiration for their initial home search. The Pinterest page is updated with new images daily.